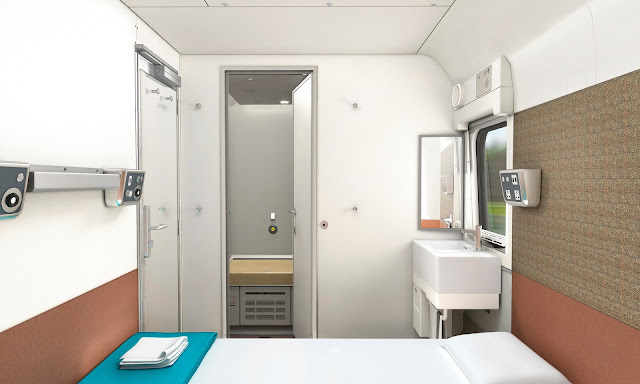 When the new sleeper coaches enter service between London & Scotland passengers will be offered en-suite cabins with sleek new styling. The sleeper train, beloved of thriller writers and art directors, is making a comeback in Britain. Serco, the operator of the Caledonian Sleeper night trains connecting London and Scotland, has revealed details of a £150m revamp, including en-suite cabins with double beds. Serco took over the Caledonian Sleeper franchise in 2015 promising major improvements, and part-funded by the Scottish government. The company’s chairman, Peter Strachan, has said its aim is to re-establish the Caledonian as “a symbol of Scotland”. The 75 new carriages are being built in Spain, with the first being tested in Czech Republic before travelling to the UK via the Channel Tunnel. They are due to come into service next spring. 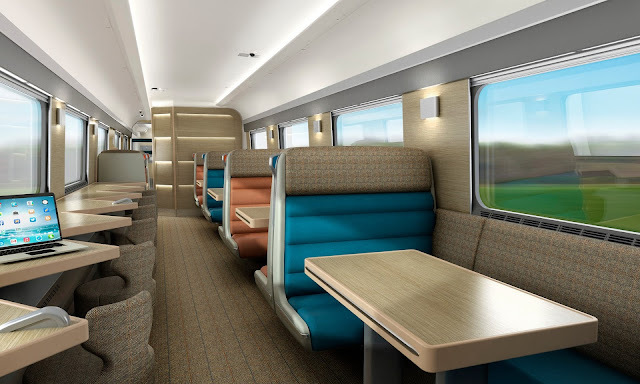 As well as double beds and private bathrooms for couples – at yet-to-be revealed prices – the carriages will also have wifi, hotel-style key cards and sleek new styling by the Scottish interior designer Ian Smith. Using “patterns reflecting a contemporary Scotland theme”, it will replace the brown panelling and rampant tartan of the old carriages. The death knell had been rung repeatedly for the surviving UK sleeper services, to Scotland and the West Country, and for many more across the continent. It was thought that a nightcap in the dining car and a night in a narrow berth could never compete with budget airlines and the proliferation of short-haul routes. Many services did vanish, but the survivors are fighting back as air travel becomes less alluring with ever-shrinking baggage allowances, strikes and delays, as well as longer queues for security checks and passport control. ÖBB, the Austrian state-owned rail operator, has announced a major expansion of its sleeper service, with “Nightjet” trains targeting business travellers and families as well as tourists, and more trains across Germany, Italy and Switzerland. At the luxury end of the market, passengers are happy to pay more than £2,000 one way from London to Venice for sumptuous travel on the Orient Express, but ÖBB will be competing with airlines with fares such as €149 from to Venice from Vienna. The Scottish sleeper service has run from London since 1850, when steam trains hauled wealthy Victorians out of the grime of the capital to go on hunting and fishing holidays in the Highlands.